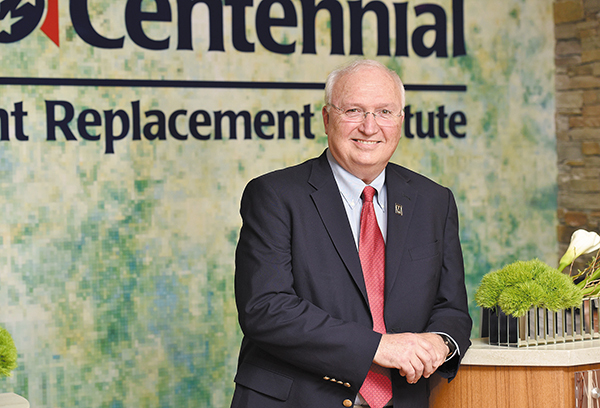 Thirteen months in building, 24 months in development and 30 years in the making - the new TriStar Centennial Advanced Joint Replacement Institute represents a dream come true for Michael Christie, MD, co-founder of Southern Joint Replacement Institute (SJRI) and a driving force behind the new 'hospital within a hospital' that opened last month. Located on the eighth floor of TriStar Centennial Medical Center, the $96 million, 50,000-square-foot center includes 18 pre-op areas, 10 surgical suites, 17 PACU bays for recovery, a learning center and bioskills lab, state-of-the-art central sterile processing area, vendor storage, and 29 dedicated med-surg beds one floor below used solely for joint replacement patients. "In 2013 in the U.S.A., there were 300,000 hip replacements performed, 700,000 knee replacements," said Christie. "They are estimating by 2030, there will be three-and-a-half million joint replacements a year." With aging baby boomers driving demand ... and demanding a high level of quality and patient experience, HCA committed to creating a facility that would meet those expectations. The chance to build out such a technologically advanced joint replacement center is what drew the physicians and staff of SJRI to TriStar Centennial Medical Center several years ago. "What surgeon gets this opportunity in a career?" asked Christie, who is medical director for the new Advanced Joint Replacement Institute. "This is a dream come true." 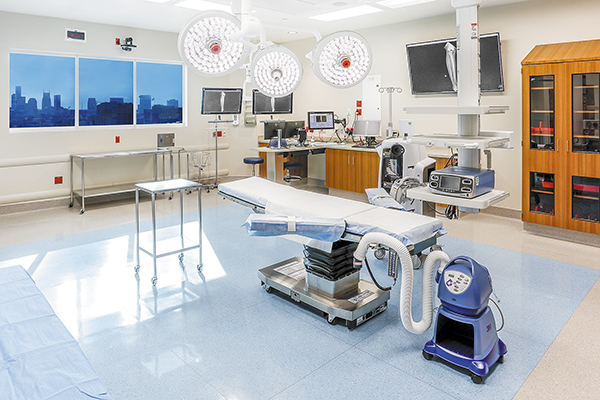 Having given plenty of thought to an ideal surgical suite over a career spanning more than 30 years, Christie had plenty of input into the design of the 10 operating rooms. Each surgical suite has tinted windows that can be automatically dimmed on bright days or lightened on dark days, and each is outfitted with the latest technology and equipment. Physicians and nurses can pull up all the necessary information on a patient with the touch of a few buttons on the monitor. 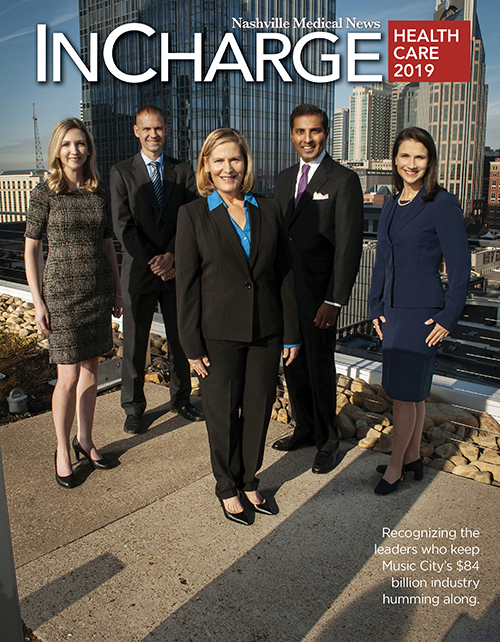 With large windows overlooking the downtown skyline, HCA headquarters, or the Parthenon ... the views aren't bad, either. In addition to equipment choices, processes also have been carefully considered in the design. Each operating suite has sub-sterile rooms attached. After the patient enters the operating room, Christie said no one comes in or out the main door, with staff utilizing side entrances from the sub-sterile areas instead. "It's designed so you're not allowing the outside environment to go back into the room," he explained. But the best part of the surgical suites has to be "the size ... it's exactly right," Christie noted of the large, 660-square-foot rooms. 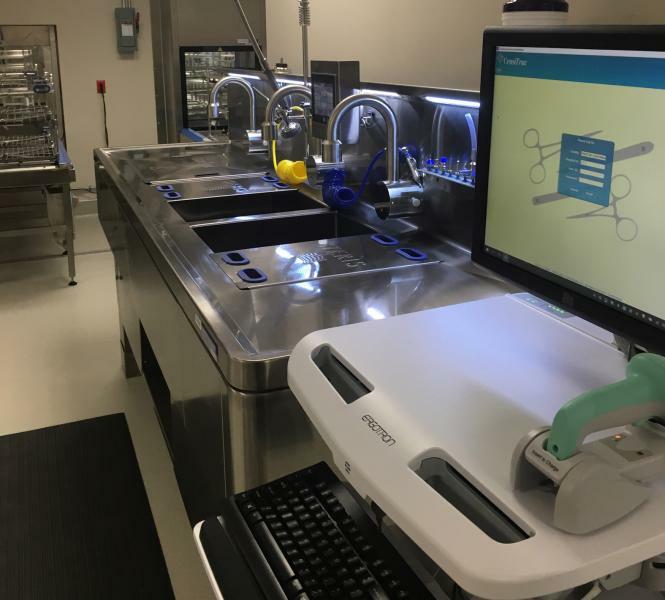 Brandon Hollis, administrative director for SJRI and the Advanced Joint Replacement Institute, echoed Christie's sentiment on size, noting the large rooms comfortably allow for all the equipment that comes with joint replacement, including the MAKO robotic technology. 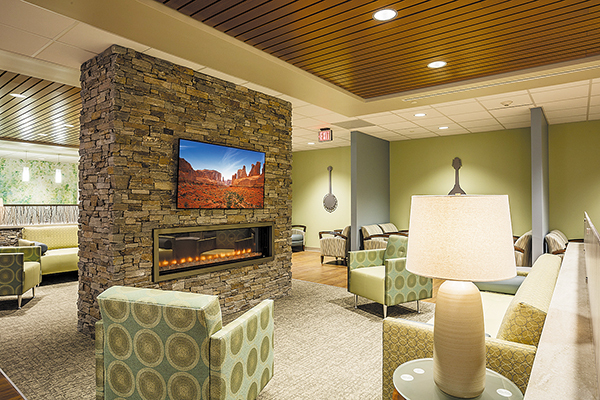 While there is much for physicians and staff to appreciate about the new space, the center's design was driven by a patient-centric focus on quality, comfort and care. Family members and caregivers were given careful consideration, too. The comfortable waiting area includes concierge service and is decked out with a large television, fireplace, and coffee bar. Radio-frequency identification (RFID) tracking is utilized and each patient assigned a number so those waiting can follow the progress through surgery and recovery. Christie noted care begins long before the first incision. "The blessing we have with joint replacement is it's elective in it's timing so that allows the surgical team to get that patient optimized to successfully get through the operation," he said. He continued, "They start therapy before the surgery so there is a 'pre-hab' patients go through. We know that if you're stronger going into the operation, you do better. And since we have control over timing ... it's not an emergency ... it's all about getting you ready for surgery." Patients and caregivers attend a class before the joint replacement, as well, to explain the process and set expectations for the surgery and recovery. They are given a phone number and assigned a valet who will park the car on the day of surgery and direct the patient and family to the eighth floor, where they are greeted and taken to pre-op. Once surgery is complete, the first steps toward successfully rehabilitating the joint begin. Early ambulation is key to positive outcomes. "About 90-95 percent of our joint replacement patients are ambulating the same day," Hollis said. He noted a therapist would come up to the eighth floor for same-day discharge patients. Otherwise, patients are seen on the dedicated inpatient floor below about two hours after surgery. "We know patients get home sooner and get better faster if they walk day of surgery so that's the goal," Christie concurred. Christie said the new facilities support teamwork. Care begins with schedulers and staff in the practice helping prepare patients for surgery and continues from surgery to recovery with many hands impacting every patient. From administrative staff and techs to surgeons and nurses, successful outcomes are dependent on everyone pulling in the same direction. "The intent here was to establish the sense of a team. Most hospitals - most big companies - are organized in silos," Christie said. "Here, it's a team ... one single team. 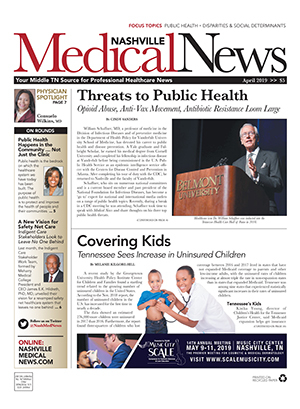 You're all doing the same things together to take great care of these patients," he added. After all, Christie pointed out, "It may be our third knee that day, but that's your only knee. The whole goal here is to remind us all every day that we have to cherish our patients." To deliver the best care, Christie noted it's important to keep learning. Continuing education, therefore, is another important theme of the eighth floor. 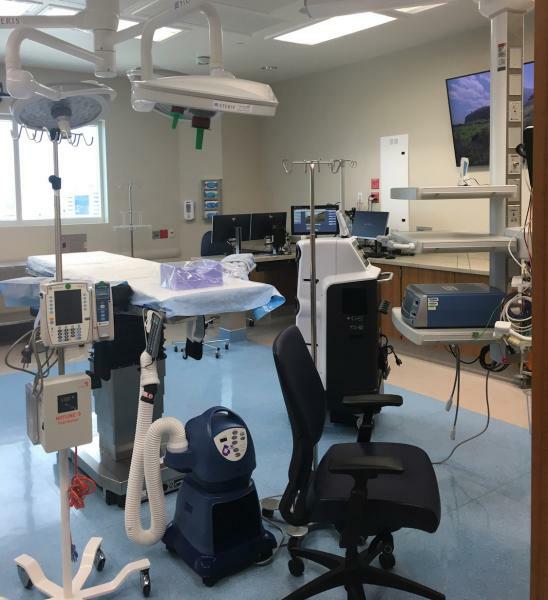 Originally, the space called for 20 pre-op rooms, but Hollis said the surgeons wanted an area to train interns and fellows so two of those rooms became a learning center and bioskills lab. 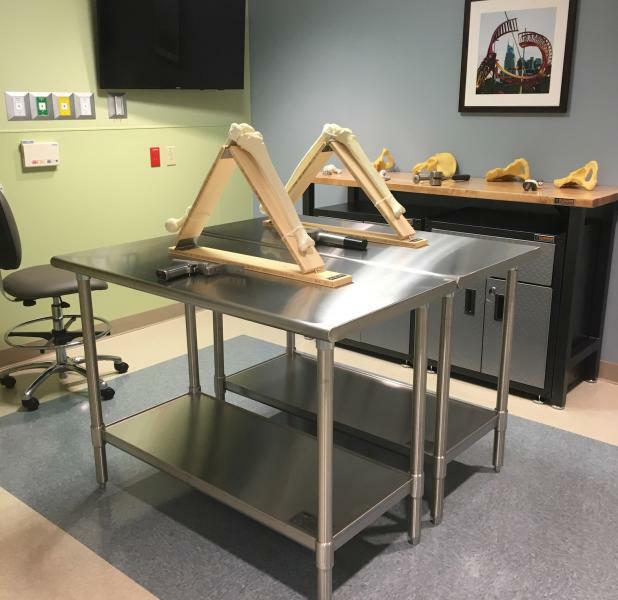 "What we can do in here is set it up just like a surgery, but it's non-sterile, and we buy these synthetic bones - they're called sawbones - so we can train surgeons on how to do the joint replacements," he explained. The nearby conference room outfitted with a whiteboard, microphones and cameras for presentations, video and phone conferences also facilitates continued learning as surgeons, hospitalists, anesthesiologists and other clinicians connect to discuss cases and best practices. "We collect data on every patient, we analyze that data, and we modify what we're doing in terms of our treatment based on that analysis," said Christie. He added that type of continued analytics over the last few years has led to a change in the way anesthesia is delivered to better enable early ambulation. Christie said the center is open to fellowship-trained surgeons who have privileges with HCA. He added the focus is on major joints with most replacements expected to be shoulders, hips and knees. Hollis said the goal is to have about 20 joint replacement surgeons using the new Advanced Joint Replacement Institute, and added it's pretty straightforward to book a surgery. "We use the same scheduling system as the main hospital," he noted. The first surgery was performed at the new facility Aug. 6. For more information, go online to tristarcentennial.com.